Today I want to tell you about a new social platform that allows you to stream LIVE video to an almost INSTANT audience. It’s called Periscope and it is SUPER cool. In fact, it’s more than cool. If you use it wisely you will soon have an army of new followers that you can reach out to with the push of a button. Other than what I just said above, it is a new platform owned by Twitter and it was launched earlier this year on 26th March (2015). In recent months it is seeing tremendous growth and it is something that you should be getting involved with now. To use Periscope all you do is download the Periscope app for either Apple or Android, load it up, create a Twitter account and link it up. All that is left to do then is type in a “title” for your broadcast and then click on the “Start Broadcast” button. You will start to stream LIVE video from your phone and people from ALL over the world will start to view your broadcast. This is almost instant. Your viewers can then type a comment and engage with you and you can talk to them and answer questions etc. If your viewers like what you are sharing they can tap the screen and give you some “Hearts”. Unlike Facebook where you can only “Like” something once, with Periscope you can tap away and give as many hearts as you like. Just like a webinar viewers can drop in and out as they please so the more engaging that your broadcast is, the more people you will get watching you (or whatever you’re sharing / filming). … and the concept of this takes VIDEO and live broadcasting in a whole new direction. I created an account on Periscope around mid September and was blown away when I made my first broadcast. I didn’t have any content prepared and it was literally just me and a couple of my friends. I just wanted to see what it was all about and to take a closer look at how it worked. Before I clicked “Start Broadcast” I thought to myself, “Are any people REALLY going to view my broadcast”? I was doubtful to say the least. After about 3 seconds of clicking that button my first viewers joined. They were somewhere in the world watching me. It felt rather bizarre but good at the same time. I said hello to them and asked them where they were from. They started typing away and as I joked on with my friends kind of “hosting an online party” more and more people joined. The broadcast lasted about 18 minutes and during that time about 120 people had joined with about 35-40 people watching and engaging at any one time. After that first broadcast I realized the possibilities this new platform had. It wasn’t just for having fun and sharing LIVE video of “Times Square” or people “eating pizza with their friends”. It could be used to connect with a wider audience, generate more followers and fans, and to bring more traffic to your site. 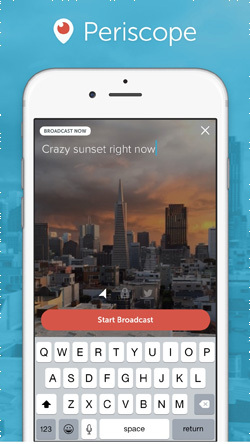 Let’s take a look at just a FEW examples of how you could use Periscope. This is purely to get the cogs working and to get your creative juices flowing. If you have a cooking website you could do LIVE broadcasts showing how to prepare foods, cook recipes etc. Not only could your members or readership follow you, you would also get new fans and followers from the VAST growing number of Periscope users from around the world. Imagine being in the gym and showing an audience how to do certain exercises and sharing “workout” tips LIVE during a broadcast. Over a little bit of time how many more followers do you think you’ll have? Quite a few I would imagine. If you hold events then think how beneficial it could be for your customers and audience to be able to see a “Glimpse” of some of these events LIVE? That’s advertising at its best. If you travel lots and run a blog themed around your traveling then how cool would it be to be able to broadcast LIVE video to your readership from different locations? Also, think how many more followers and visitors you could get just by sharing this LIVE content with the world with the push of a button. Periscope can be used for anything. Whatever niche you are in, whatever sites you own… it’s makes no difference. Periscope will provide you with a NEW platform to connect with your visitors and give you a way to tap into a new, growing traffic source. All in all, it is nothing short of amazing. I’m going to be using it myself to share content, tips and everything else. As well as general broadcasts such as throwing the ball for my crazy dog. Yes, people like to see that stuff too. I might even do one of those “general” broadcasts later so if you want to join me and say “Hello” to me and my dog then download Periscope to your phone and follow me…. A friend of mine called Michael Cheney (you may have heard of him) has gone ALL out with Periscope this last few months and is now actually a BETA tester for Periscope. He has absorbed himself into the platform 100% leaving no stone un-turned. He has become the “go to” guy within our community when it comes to Periscope. I have been watching Michael’s broadcasts since I first downloaded the app… Even whilst I was on honeymoon. The traction (Hearts and followers) that he has got in such as short time is unreal. If there is anything he does not know about Periscope then it isn’t worth knowing. 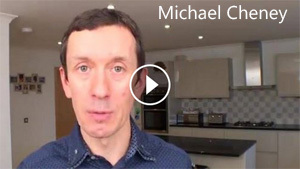 If you would like to explore Periscope further so that you can capitalize on the huge amount of instant traffic that it can offer, or if you would like to use it as another avenue to connect with your visitors then I urge you to at least look over a new product that Michael has made available. It is called “Scope For Cash” but here is the kicker. It is ONLY available until midnight EST this Sunday. I recommend you at least read through his page… this guy knows what he is talking about and by going through his course it would save you months of your time and LOTS of mistakes. If you would like to take a look then head over HERE. Remember, this is fairly “Under the radar” and it CLOSES this Sunday.